This is Megastorm's new form, powered up under the influence of evil Angolmois energy. 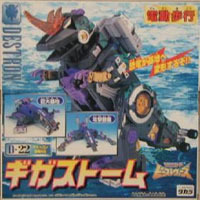 He transforms in three stages, from destroying dinosaur to monolithic base to attack fortress. His audacious offensives, making use of his tremendous power, force the Cybertrons into tight spots again and again. He is on the verge of no longer considering Galvatron his older brother, and the danger of a split in the camp now looms large. The Gigahorn on his head is harder than diamond, and can pierce through all manner of things.